Shifting and unstable soils jeopardize the structural integrity of a foundation, whether new construction or an existing building. Avoid costly structural and foundation repairs before construction begins with Foundation Supportworks' Helical Pier System. 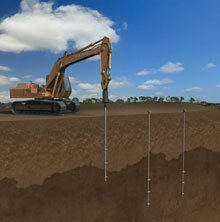 Helical Piers are mechanically screwed into the ground to predetermined depths or capacities. The tops of preconstruction piers are cast into the column pads or grade beams, effectively transferring the building load to deep suitable soils. Retrofit helical pier applications sometimes used for lighter structures as an alternative to push piers utilize a steel foundation bracket to transfer the building load from the foundation, through the pier, to the competent soil strata. The helical pier system is often more affordable than over-sized engineered concrete footings or removing and replacing the unsuitable foundation soils. A helical pier system can significantly reduce potential settlement, as compared to shallow spread footings bearing on soft or variable soils. The helical pier system can be installed year-round and in just a few days without the use of heavy equipment. 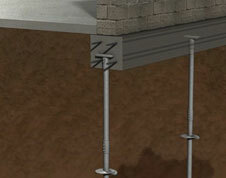 On lighter existing structures, helical piers can also be used as an alternative to push piers. 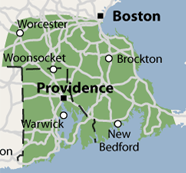 Contact Foundation Supportworks for a free no obligation helical pier estimate in Providence, Boston, Cape Cod, Fall River or nearby with a certified representative. Protect the investment you are making in your property with a cost-effective solution that will keep your building on solid ground.